Keys for Kids Radio - 24/7 Streaming Music and Audio Drama for Kids! - Love is Not Easily Angered - Love Does Giveaway! We’ve all been there. It’s been a really horrible, no good, very bad kind of day and you are mad. Everything and everyone is making you angry. Or, a trusted friend or family member has hurt you, with their words or what they’ve done and again, you are mad. Either way, you feel hurt and want to give pay backs to those around you. So what do you do? What does God want you to do? God says that anger itself isn’t bad and that you can be angry and not sin (Ephesians 4:26). So we know that it is possible to be angry and not hurt people. Here are some tips to help you. This may mean counting to ten, walking away or going to your room for a little alone time. Find a way to give yourself space to gain control and reboot AND it’s also a great time to ask God for help. Memorizing verses from the Bible and saying them to yourself is a really, really good idea too. Everyone messes up from time to time and you need to get good at forgiving even when you don’t feel like it. It’s a choice you can make! Decide to forgive, Ask God to help in healing your hurt, Tell the person you forgive them and Do Forgiveness by finding ways to show love and kindness. As with anything you need to practice not getting angry. The more you do it the better you’ll get at it. Make a game plan ahead of time of what you are going to do the next time someone tweaks you and you feel anger starting to rise up in your heart. The best way to not be “easily angered and keep no record of wrongs” is to DO LOVE! Try putting others’ needs ahead of your own looking for ways to help and be kind to those around you. It is amazing! By getting your eyes off yourself you’ll soon forget about the annoying things that used to make you angry. “Love is patient, love is kind….it is not easily angered, it keeps no record of wrongs.” I Corinthians 13:4-5 Just let go of being easily angered today. Let it go! 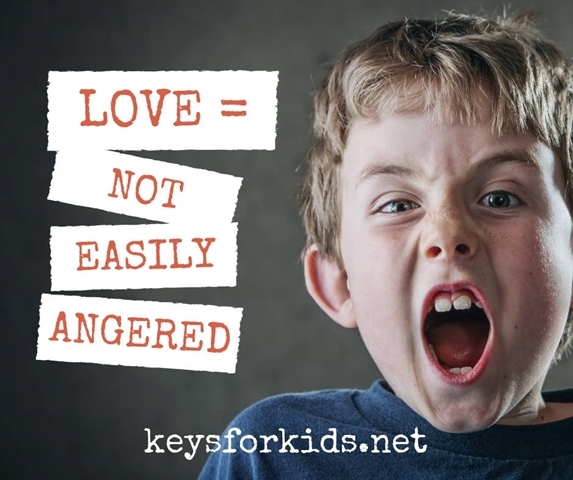 Join us for more from 1 Corinthians 13 as a part of the Love Does Giveaway through Valentine’s Day on Keys for Kids Radio! You could win the Love Does Prize Pack when you send us a story of how you've shown love to someone!